Once again, I’m participating in a cookie exchange this year but this time at work! I strategized and decided that really, the only way to get four dozen of one cookie made was to go with my tried and true Venetian cookies aka rainbow cookies for the exchange. Once you get over the baking and layering, one batch easily produces a lot of cookies depending on how you cut. But, along with the any cookies I manage to grab at the cookie exchange, I wanted to make a batch of cookies for me and Paul to eat to our hearts content: Kahlúa balls. Yes, I’ve been on the Kahlúa bandwagon lately, using it in tiramisu and donut shooters. But if you take a look at the label of any Kahlúa bottle, it’s really rum AND coffee. Why buy a separate bottle of plain old rum when you have Kahlúa on hand? Rum balls don’t require baking. You simply mix crushed vanilla cookies, pecans and powered sugar with Kahlúa and honey. 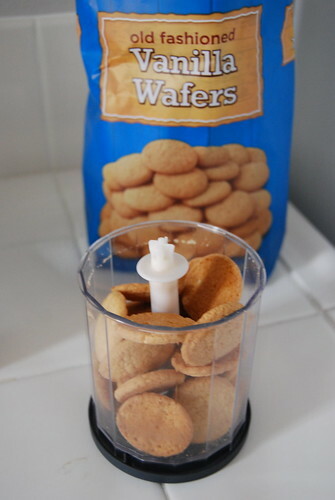 The hardest part is rolling them and not eating them in the process. 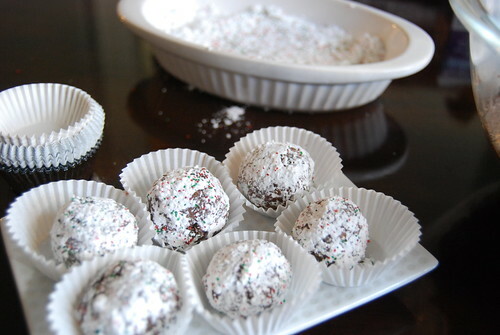 To prevent the rum balls from sticking to each other, they’re rolled into powered sugar. And since it’s the holidays, I also added red and green sprinkles into the powered sugar. Using a food processor, crush cookies and pecans and pour into large bowl. 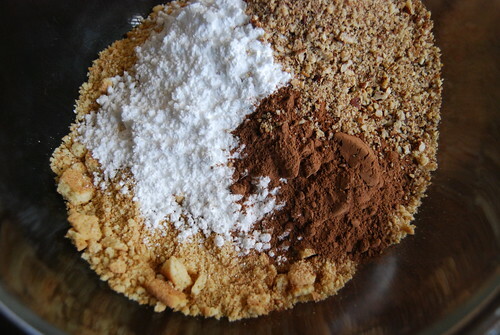 Add sugar and cocoa to bowl and mix until incorporated. Add liquor and honey and combine. Using a teaspoon, form balls and roll into powdered sugar. Store in an airtight container up to a week. How did I not know Kahlua was rum-based? Kahlua balls sound much tastier than regular rum balls. I may have to make some before the world ends now. Yes, I just noticed it on the bottles too. Glad to see you survived the end of the world! I’m now a huge fan of something that doesn’t require baking. Like your saltine candies! A must-try for Kahlua lovers! Looks like an easy recipe. Any alternative for pecans?